I was able to go to Alexandria, Louisiana at the end of September for two Shelley Pleines (Nybakke) classes. It was so great seeing her again. Shelley and I met at NanC Meinhardt’s Art Sticks class back in April. Katie Nelson, from South Texas, was my roommate for the weekend. As soon as I pulled into the parking lot at the hotel, she jumped in and we headed to the local bead shop. We know how to keep our priorities straight. After we had fun buying beads, we met Ida Williams, from North Louisiana and Judy Hendricks from North Texas at a cute little restaurant. I wish I could remember the name of the place. You may know Ida from the Shreveport Bead Retreats. She also is the Ultra Suede lady. 🙂 We all got to know each other better and had a great meal, too. Back at the hotel, Katie had a big box of goodies for me. She really spoiled me. She always does but this time it was lots and lots of wonderful goodies. I think Ida and Judy must have felt the beady goodness emanating from the room and stopped by to look through some de-stash beads and goodies that she was going to bring to the class for everyone to look through. They both got lots of great things. Then we started sharing websites and designers and looking through some beading books that Katie brought. A good time was had by all. The classes were held at Lynn Tarver’s studio. Thank you Lynn for hosting this gathering. There was enough food for an army. Shelley wasn’t going to go home hungry and neither was anyone else! Saturday’s class was Kisses of Fire. 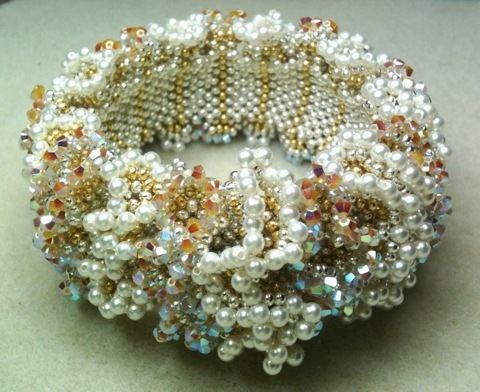 This bracelet can only be described as blingalicious. 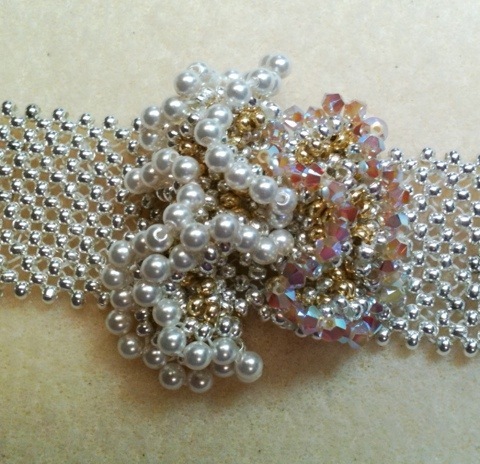 It is made with metal seed beads and embellished with pearls and crystals. The bracelet has a hidden snap clasp. The base is right angle weave with piles or ridges. Ruffles are built off of the ridges. I had two ruffles completed before I realized that my ruffles weren’t nearly as fluffy as Shelley’s example. Shelley figured out pretty quick that I had left out two (just two!) 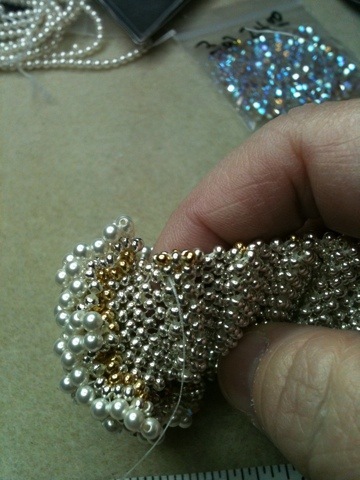 beads on the ends of each ridge, at the beginning of the increase rows. Can you see those two little gold beads at the top of that ridge? They are very close to where the thread is coming out. Those are the ones I missed on my first ruffles. The picture below shows my pitiful ruffle to the right and the correct ruffle to the left. Big difference, right? After finding my mistake, all was good. Once I got home, I made it a priority to go ahead and finish up this beautiful bracelet. It’s a really stunning piece of jewelry. On Sunday, Shelley taught us Jules of my Heart. The bracelet is named after Shelley’s grandson. It is predominantly right angle weave made with metal seed beads layered with glass seed beads and embellished with crystals. The squares are then ruffled on the outer edge. The join between the squares is like the ones in her Egyptian Collar. The clasp is a hidden snap. I had a great time in Alexandria. I enjoyed seeing old friends and making some new ones. Thanks again, Lynn, for having all of us over to your studio. Thanks to Kriss Self for arranging for Shelley to come to Louisiana. And a big thanks to everyone who brought food. I still need to get Judy’s recipes for the desserts she brought. Talk about good! This bracelet is absolutely spectacular and I have just the place I could wear it. Do you by any chance know where I can get the pattern for it? If the pattern isn’t shown, she is probably still teaching it. Typically, when the pattern is in their list of class offerings, it’s not available as a pattern for purchase. This is the first time I’m seeing Kisses of Fire completed. It looks nothing like I thought – much more elegant and stunning. Beautiful job! It’s a show stopper, Kathy. It’s pretty spectacular.